Floating in complete darkness, with no sense of where your skin ends and the water or air begins: no light, no sound, no smell or taste—nothing but you and your own mind. It’s an intriguing idea to some, terrifying to others. Sensory deprivation/isolation tanks have been around a long time, but they died out a couple of decades ago, only to experience a rebirth in the last few years; they’ve been rebranded under the much friendlier-sounding moniker “float tanks.” The Edmonton area is currently home to four float-based businesses—with more on the way—and all of them aren’t much more than a year old. Flotation therapy is pretty much exactly what it sounds like: you float in a tank filled with water, which has been saturated with Epsom salts to the point that it’s actually impossible to sink, allowing you to lie back and fully relax your body. The tanks are some variant of an egg-shaped bathtub with a lid, though float chambers also exist—small rectangular rooms with water in the bottom. 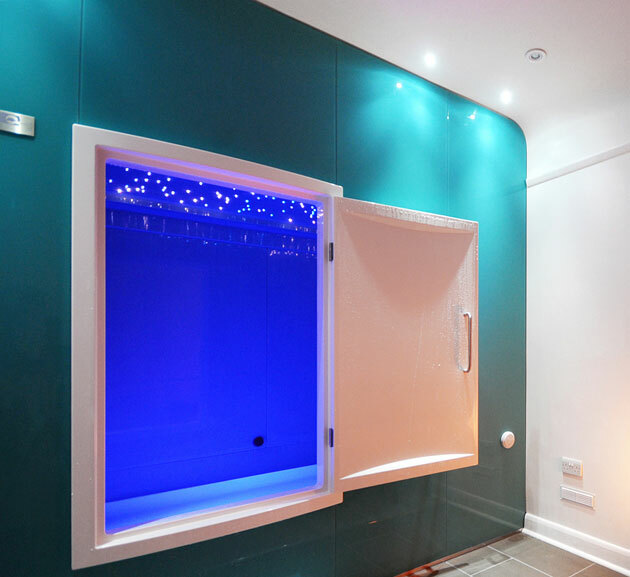 Both the air and the water in float tanks are heated to skin temperature (about 34C), and the tanks are usually completely dark (some have soft lighting options) and devoid of any other stimulus. The whole idea is to cut off all external sensory input so that you can simply relax with your own mind. When Matthew Smith and Jamie Phillips started Modern Gravity Float Studio at the beginning of 2014, they had just a single tank in Smith’s basement. Though they were the only ones in town offering floats to the public, they knew it wouldn’t be long before others followed, so they decided to expand. Modern Gravity is set to reopen its doors on November 15, and it will feature six float rooms. Smith’s first float was in a private residence in Red Deer. He decided to pursue it purely from a health standpoint: he was heavily involved in athletics at the time and had been taking his own Epsom salt baths at home, so the idea of a large saltwater tank was very appealing. After getting a little freaked out upon being led to an unfinished basement with just the tank in the middle of the room—”There’s just this coffin-looking treasure chest just sitting in the middle; I was like, ‘Oh my god; this is terrifying!’”—he quickly eased into the experience. To his surprise, he emerged over four hours later with no idea so much time had passed. Since then, he has gone in for as long as 12 hours at a time—most people will only experience floats in hour-long sessions, the most commonly offered choice at float studios. Admittedly, floating sounds a bit hokey—even bizarre—but these sensory deprivation tanks are founded on science. They were invented in 1954 by neuroscientist John C Lilly as part of a series of psychological tests he was conducting to see what would happen to the human brain if it were deprived of all sensory input. The tanks have evolved since then—and thank goodness, because if you look up some pictures of the apparatus people had to wear in order to use the original model (like a skin-tight latex mask that would definitely make you feel like you were being smothered), they sure wouldn’t be marketable today. Contemporary float tanks and rooms can look downright futuristic, like something right out of science fiction—a much more welcoming, or at least intriguing, prospect. Flotation is often described as a meditative experience, and some people have even reported having transcendent or out-of-body-experiences while doing it. This, along with its representation in popular culture (most famously in the 1980 horror movie Altered States), made flotation associated with the New Age crowd. Smith’s approach has always been fundamentally practical. He wants everyone to experience flotation’s multiple health benefits—many of which have been corroborated in recent scientific studies, with some doctors beginning to prescribe flotation therapy to their patients as an alternative to more invasive and/or drug therapies. Smith is also the vice-president of the Canadian Float Collective, which is hoping to get flotation therapy added to the list of services covered under benefits plans. There’s no denying that being alone with only our thoughts, even for just an hour, could be quite emotionally confronting. And that might be just what a lot of people need, even more than relaxing their muscles and joints: facing the things buried deep in our subconscious minds in order to make it through the rat race, day after day. Dufault works as a denturist and did her first float a few months ago in Calgary. Though she found it a pretty weird concept at first, she absolutely loved the experience and is planning subsequent floats. In addition to immediate physical health benefits that floating provided her (“I felt finally like my neck had released a lot of stuff,” she describes), Dufault also experienced a boon to her mental wellbeing. Like yoga, chiropractics, acupuncture and other therapeutic modalities, floating is a mixed bag: some people will love it and some won’t. Its price tag means that it’s not something most will be able to experience on a regular basis: single floats usually cost between $60 and $80, but some places offer memberships or multiple pass deals. If you’re interested in it at all, however, both Dufault and Smith suggest giving it a try to see if it works for you. “There really isn’t that much difference from the relaxation, physiological side of your mind and body, and the more spiritual side of our body, the emotional side,” Smith says. “Stress is a physical thing and can make you sick if you’re stressing out about stuff; at the same time it can make you depressed on more of a chemistry, emotional level.